Please don’t stop posting pics. You can add them direct to any Gnatterbox post (including editing previous posts with Flickr links) at no cost to you. I’d suggest keeping the size down to 500k or less though please to help ensure they load fairly quickly for the rest of us to enjoy. To be quite honest Chris I think I have covered every aspect of the model as it stands. I have a thing called polymyalgia which affects my hands so making any new models in the near future is unlikely. I still manage to operate it and attend a few shows every year though. I bought a few second hand magazines the other week from a charity shop and among them was a copy of the 2018 December issue of Railway Modeller. It had an article about an attractive 00 scale small exhibition layout called “Sixpenny Handley” which featured a selection of modular scenes that could be changed. I remember seeing the layout in the flesh at Rushden earlier in the year’ being operated by a father and his son. In the write up about the layout it says the inspiration for the model was a layout called Two Sister’s Farm which they saw at Kettering. I remember doing the Kettering show on my own and a young lad having a drive for some time while I took a comfort break. He told me he had a layout at home but never had operated it in a realistic fashion. He quickly adjusted to operation and after a short time became completely at ease operating in a realistic way. He thoroughly enjoyed himself and said how quickly the time passed. 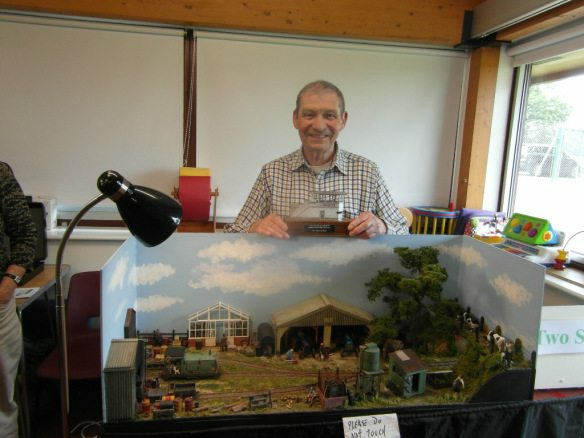 Two Sister’s Farm won the best layout in show that year and I have often wondered if my young operator and his friends were responsible because it‘s not the sort of layout the public vote for. I am however delighted that my efforts inspired someone else to have a go at building a layout of their own. Congratulations on inspiring someone to make (and finish) a layout. I liked seeing your last photo - a punter’s eye view of the whole layout rather than the more normal camera’s eye view of a bit of the layout. I’m sorry to hear about your polymyalgia. As I get older I encounter all kinds of strangely named afflictions I hadn’t heard of before. 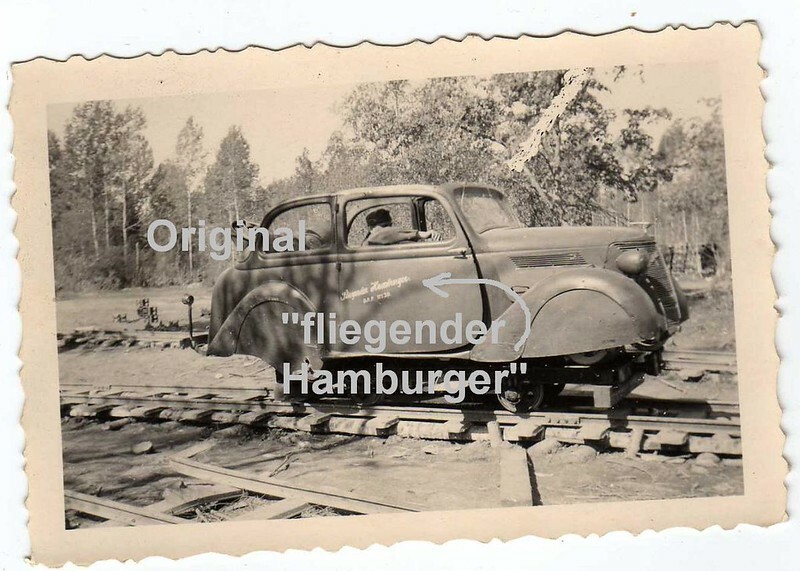 How about this WW2 German Army car (Opel?) converted to run on narrow gauge track. I'm sure it would be right at home on the farm. Sorry for the delay in replying, I've not looked at this thread for a few weeks. Yes I'm sure that would look fine on the farm, it is something I will have to give some thought to. At the moment I am spending a lot of time trying to sort out the track work on my GWR shunting plank. Thanks again for the head up.